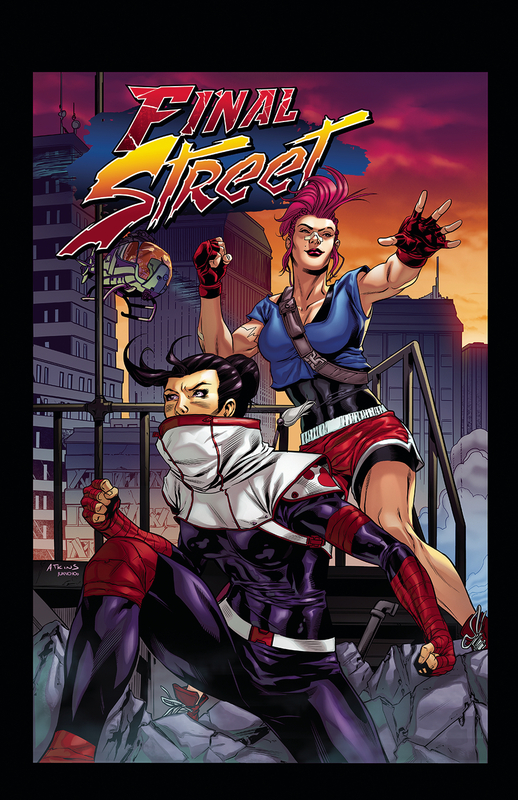 Sometimes all you want to do is read a comic that is written as a love letter to your childhood, and that is exactly what you get with Final Street. Reading the blurb for the book, right away you know that Schmidt and Atkins have created this book out of a love of old-school beat-em ups and classic fighting games circa the Nintendo/Sega age of prominence. What we also get from the blurb is that this isn’t your typical “Rescue princess” scenario - they’ve decided to gender bend the roles for this comic to circumvent the tired trope of woman gets kidnapped, men fight to get her back. That trope should be retired, and I enjoyed that Schmidt and Atkins basically do so with this first issue. As for the comic itself, the whole setup is pretty basic and leads to the action almost immediately. We are introduced to Sullie and her boyfriend Franklin as they go out for a bite to eat after what one presumes is a pretty intense workout. Barely do they have time to dig into their ramen that the local gang, The Brawlers, kidnap Franklin from the restaurant, leaving Sullie dumbfounded but ready to get him back. Enter her friend Kumi followed by a pretty long action sequence. When reviewing independent comics, sometimes the art doesn’t always live up to the script that is being produced, but I can say that Atkins’ work in this comic is pretty darn good. His character work is expressive, his actions sequences have a certain amount of weight behind them (which is needed for an action comic like this), and his character design is a lot of fun. The character of Sullie and Kumi have some typical attributes that you’ll probably have already seen dozens of times before, but for what this comic is going for, it fits. What makes the art jump off the page though is the color work of Juancho and Carlos Moreno. This is one aspect where some independent comics falter sometimes - the colors in a comic can bring a lot to your creation, and sometimes it’s not up standards. This isn’t the case here. Juancho and Moreno give a good blend of bright colors with good use of shadowing throughout. I’d be remiss if I didn’t mention the presentation of the comic in this review. Unlike a lot of mainstream comics where the presentation isn’t always a needed selling point (I’m looking at you ugly cover banners), for an independent comic, it could mean the difference between being picked up and bought and left on the shelf. I’m going to assume that Schmidt and Atkins thought up the presentation, so I’ll give them the credit here. The issue starts off with a cast of characters, a big plus and it’s made to look like a start screen of an old video game, which is followed by a QR code to listen to the “first level’s” music (which is a pretty good bit-tune), and finally an end credits page that looks like the ending level graphic in most brawlers from back in the day. All in all, this was a really fun read for a first issue of a new property that is paying homage to old brawlers from the 80s and 90s. It’s definitely a comic worth picking up and can still be ordered from your local comic shops - publication of the physical copy will be in June.